Bollywood actor and dancer Sunny Leone on Monday shared an adorable video with her hubby Daniel Weber and kids Nisha Kaur Weber, Asher Weber and Noah Weber on her official Instagram account which is way too cute! Bollywood diva and dancing sensation Sunny Leone is not only one of the best dancers in Bollywood and a great actor but is also an amazing mother to three beautiful kids—Nisha Kaur Weber, Noah Weber and Asher Weber. Sunny adopted Nisha Kaur Weber back in 2017 in July and later welcomed two baby boys named Asher and Noah through surrogacy. 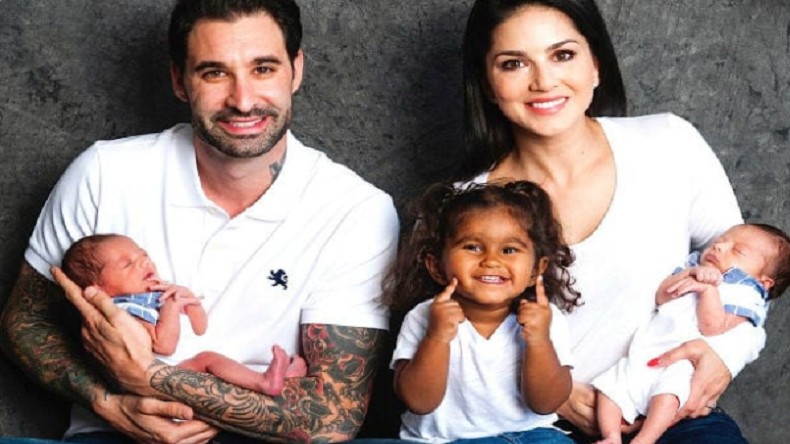 Both Sunny Leone and her husband Daniel Weber keep sharing adorable photos with their kids and also express how lucky they are to have them in their life. Once again, Sunny Leone along with hubby Daniel Weber shared an adorable and lovable video with all her three kids and it is amazing! In the video, we see the twin boys Asher and Noah in Sunny Leone’s lap as their clothes are full of water paint. Nisha Kaur Weber, on the other hand, is in the arms of dad Daniel Weber and the family looks happy and adorable! Sunny Leone is one of the most sensational dancers and item queen in Bollywood who shot to fame after participating in the 5th season of controversial reality show Bigg Boss and later featured in many Bollywood films such as Kuch Kuch Locha Hai, One Night Stand, Ragini MMS 2, among many others.